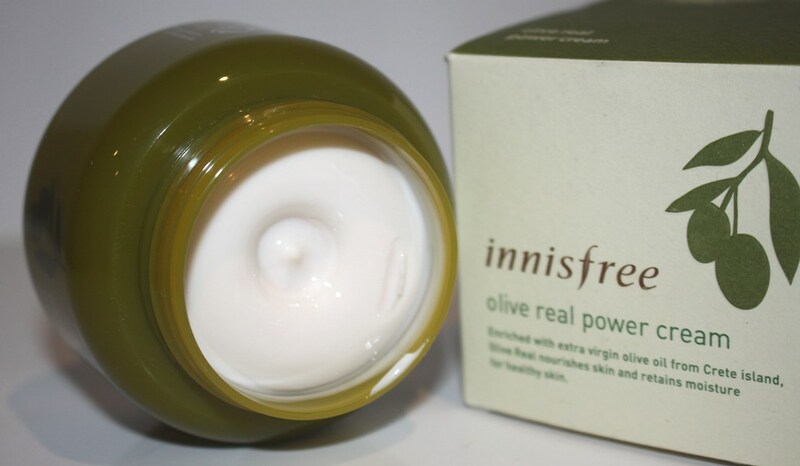 The Innisfree Olive Real Power Cream claims to be a deep hydrating cream with Olive Power Activator ᅳ tocopherol, vitamin E, and oleic acid ᅳ that provides powerful moisturization for dry skin to improve skin suppleness and create a moisture barrier. 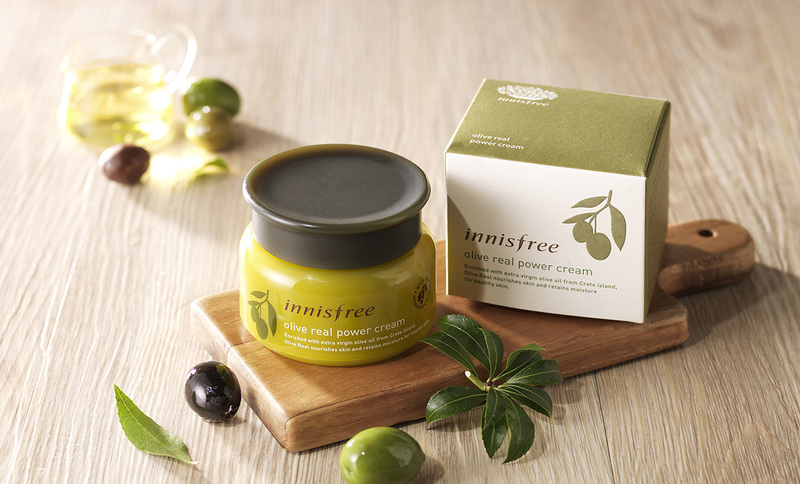 Innsifree has produced an entire range of skincare products using the oil from organically grown Greek olives. Humble squalane is sometimes referred as a “facelift in a bottle” and for good reason. Squalane is comparable to the natural protective moisturiser found in skin and as such our bodies readily synthesize and absorb it without clogging pores. After 30, the amount naturally produced diminishes which is one of the reasons why skin tends to generally become dryer as we get older and more prone to premature aging. Topical squalane application allows the skin to improve regeneration and oxygenation, replenishing and providing antioxidant protection. Squalane is a hydrogenated form of Squalene. Both are natural, botanical lipids with squalane being more stable. Squalane improves skin suppleness and flexibility and displays firming capabilities to reduce wrinkles, scars and age spots. It provides antimicrobial germ-killing activity when properly concentrated in the skin to encourage normal cell development. Squalane is colourless, odourless and a great treatment for a range of irritations (for example, psoriasis, eczema, dermatitis, stretch marks and rashes). 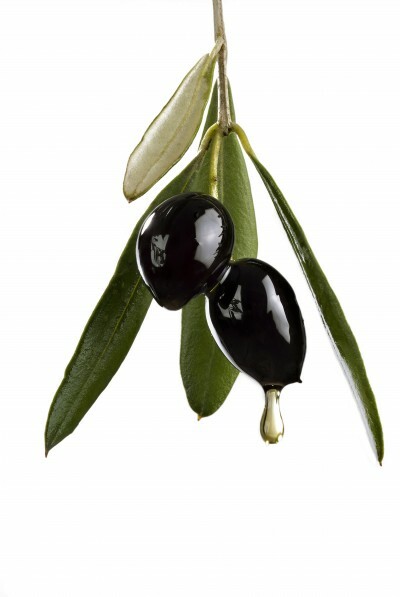 Similarly, Olea Europaea (Olive) Fruit Oil benefits dry skin because of its fatty acid content (including oleic, palmitic, and linoleic acids), some of which comes from squalene. Meadowfoam Seed Oil is a waxy oil, similar to jojoba. It retains excellent oxidative stability and displays skin softening benefits. It’s also very effective at strengthening the skin barrier and hence retaining moisture and preventing dryness. Camellia Sinensis Leaf Extract commonly known as Green Tea Extract, is one of the strongest antioxidant herbs. In order to be effective however, a product must contain a sufficient amount of high-quality green tea extract, only then may it deliver dermatological benefits such as slowing down the ageing process, maintaining skin vitality and improving tone and glow. Green tea also displays antibacterial properties to detoxify the skin’s surface, reduce pore inflammation and excess sebum production and in doing so, treat acne effectively. Mandarin Peel Extract assists to even skin tone and treat hyperpigmentation by helping control melanin biosynthesis. Remaining ingredients are included for their emollient, moisturizing and anti-ageing/antioxidant properties and their ability to alter viscosity and preserve the cream. The ingredients appear to pack a real moisture punch, selected for their collective effort to fulfil the Innisfree claim. They introduce moisture as well as reduce its loss by strengthening the skin barrier. The ingredient list of this product reads favourably due to a large number of natural oils and extracts. As such, the CosDNA analysis reflects a healthy product. Similarly, the EWG Cosmetics Database, rated it well with the exception of the added fragrance, a known irritant. Apply an appropriate amount onto the face and neck after eye cream. The ingredient list indicates artificial fragrance has been added to the formula however, the smell this moisturizer has resembles the natural components within, typically, a light olive oil scent. 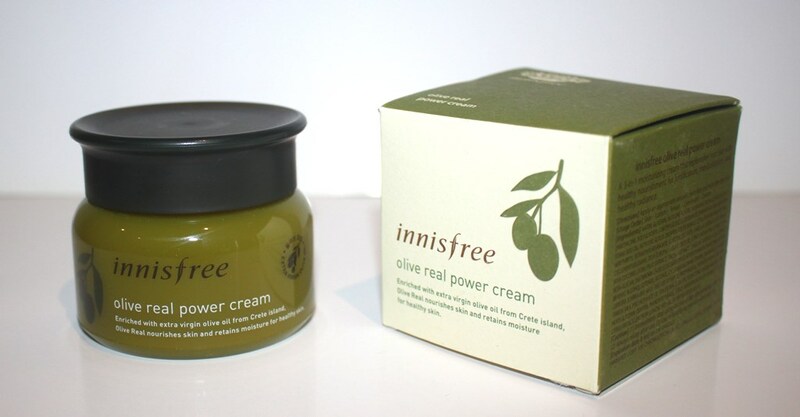 The Innisfree Olive Real Power Cream comes in a 50ml jar and sells for approximately AUD$30.00. Innisfree is a popular Korean skincare brand that is widely available online for Australian consumers. You can buy their products from a great range of stockists such as Style Korean and iHerb. 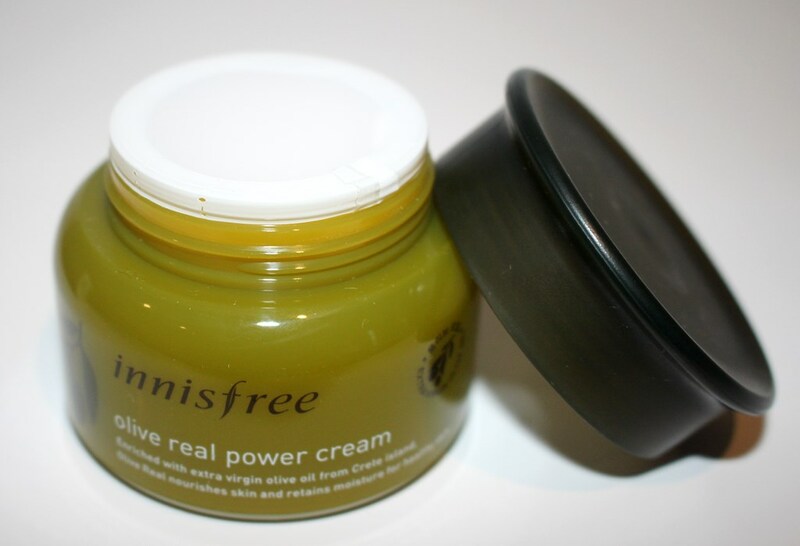 The Innisfree Olive Real Power Cream expires within 36 months of manufacture (mine must have been sitting on a shelf for around a year) and is good for 12 months after opening. The different lines within the Innisfree range are packaged with distinctive colours, representative of their key ingredients or purpose. This makes each element within each range, immediately identifiable. The Innisfree Olive Real Power Cream is well presented in a simple container reflective in colour of the star ingredient, the olive. The cream is fairly firm in texture but still retains a lot of slip upon application. It doesn’t feel greasy. I chose to try this one because I love olive oil both in my skincare and my diet! This product is definitely what I would classify as a rich moisturiser, better used at night. For me at least, it is too heavy as a morning cream. Those who suffer significant dryness may gain great benefit from it twice a day. Alternatively, if your skin is only partially dry like mine, you would only use a very small amount to avoid oily residue. I normally like to slap moisturiser on quite generously but with this cream, too liberal a coat means it will sit on the skin’s surface and just won’t fully absorb. This is a good thing, as the product will last a long time when so little needs dispensing with each application. The first couple of times I applied this cream as the last step of my evening routine, I clearly used too much as my face was still feeling oily in the morning. Applying the right amount leaves the skin feeling soft and supple, so less is definitely more. On the skin, this product feels like a cream blended with oil so you don’t need an oil step in your routine as it just gets too greasy. Similarly, I didn’t enjoy using this in warmer weather as the oil content in my skin tends to increase as the temperature rises. This cream has provided me with good moisturisation and left my face supple as promised, so the Innisfree claim has generally been fulfilled. However, it’s not an ideal choice for me. My skin type is combination (oily T-zone) but my cheeks can be fairly dry along the jaw line, so I thought using this cream would help me reach a good oil/moisture balance. Perhaps I should only apply it on the dry parts of my face and use an alternative cream elsewhere. The ingredient list is impressive with natural extracts offering desirable effects including moisture replenishment, restoration of the skin barrier and anti-ageing benefits. This trial did allow me to appreciate the moisturising and softening outcomes but I can’t say that I noticed anything in the way of anti-ageing. This is a very good moisturiser. As it is quite a rich formula, those with dry skin would get great moisturisation. It’s probably not a good choice for those suffering any noticeable level of oiliness. It’s just not the right one for me. Perhaps the Green Tea Balancing Cream would be a better selection as it supposedly offers the same level of deep hydration but in a lightweight formula. Anyone with dry skin or those needing extra moisture in the winter perhaps might want to give this one a try.